The MAC Academy builds life skills for underserved young adults by making connections with the community, networking, improving literacy, and preparing for the workplace and higher education. 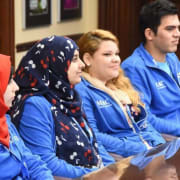 MAC was established in 2014 as a pilot program under the New York State Office of Temporary and Disability Assistance to provide employment and educational opportunities for recently arrived refugees in Rochester. After four successful years of creating community partnerships and educational opportunities and delivering demonstrated results, MAC now expands its mission to include young adults 16-25. Since its inception in 2014, the MAC Academy has served over 200 refugee students in Rochester. We assist with employment preparation and job searches, English classes, High School Equivalency classes, financial and health literacy, driving lessons, volunteer opportunities, educational field trips in the Rochester area and to Washington, D.C., and building a community network. Would you recommend MAC Academy Program: Office of Adult & Career Education Services?